Can you drink from Leather Drinking Vessels? They can be used for most cold liquids which you would otherwise put in a glass. Beer, Wine, Cider, Mead etc. Or if you really must, water. Rinse the vessel out with clear cold water and wipe the outside with a damp cloth. Will the leather be OK if it gets wet? The leather will be fine if it gets a little wet. Just wipe the water off straight away. It's much like wearing leather shoes in a rain storm. You wouldn't take them off if it rains, but then you wouldn't go and stand in a puddle. That's what wellies are for. As long as you don't immerse the drinking vessel in water, it will be just fine. They're made of leather so can I squeeze them? 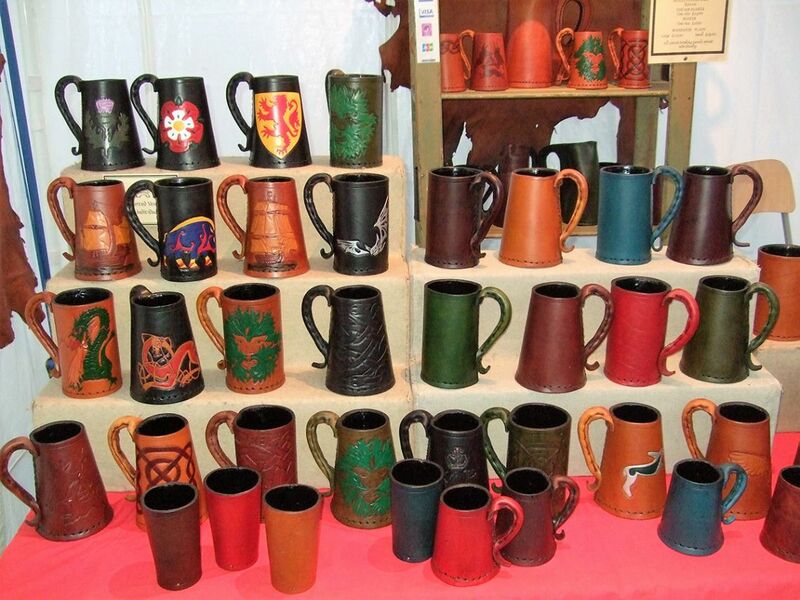 Our drinking vessels are leather which is lined with Brewers Pitch or Resin. If squeezed, the leather would be just fine, but the brewers pitch could well crack. A resin lined vessel is far less likely to crack but why try it? Instead, simply treat both linings with respect and do not be tempted to squeeze them. Can I put it in a dishwasher? Erm, no. Handwashing only please. We would highly recommend a mug for this. Can your drinking vessels be personalised? Click here for more information. Or contact us directly if you have any questions. The third Anniversary is traditionally the Leather Anniversary. It's all sourced from English tanneries, all our leather is cow hide. What's the difference between a Medieval and a Tudor time period? About two hours. Which was probably the duration of the Battle of Bosworth in 1485. More information regarding the history of our vessels can be found on our Tankard History Page. What's the difference between Leather and Hide? Long ago in Medieval times only deer skin could be called leather and was used for hat and glove making. Cow skin became known as Hide. The distinction is now often lost in the mists of time.